There are a few different ways you can buy your suit. Depending on your budget and time frame you can run into a store and grab something of the rack without any alterations made to it. Or you can give yourself what you deserve: a suit that is actually made for you. Off the rack: a mass-produced garment in standardized sizing that comes finished from the factory. A male model is used to create 8 to 10 different sizes you can choose from. The fit differs greatly from one man to another. Made-to-measure: the same 8 to 10 sizes of an existing mass-produced garment are still used but things like the length of the sleeves, jacket and pants are slightly altered to fit the body. Bespoke: the garment is constructed from scratch using a pattern based on the buyer’s measurements. Every single detail is customized to the wearer’s taste. 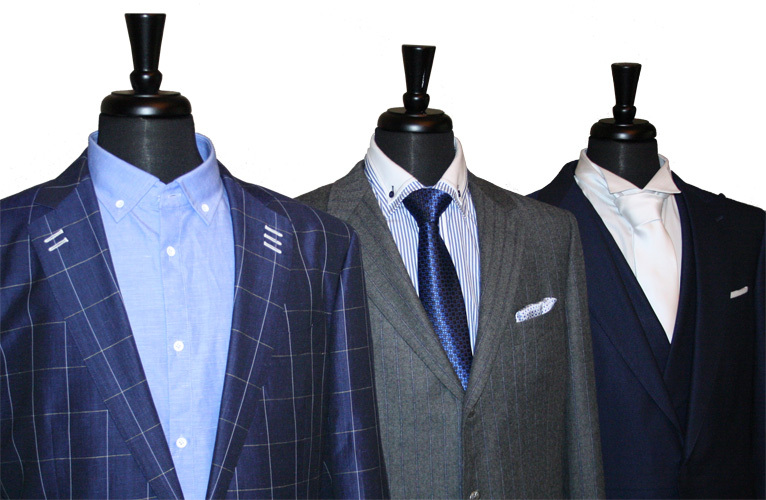 When you buy of the rack or made-to-measure garments, you are essentially wearing another man’s suit! Ready to change that? Feel free to contact us here.